In keeping with the theme of stationery this week, I thought I would share a few of my favorite tools for making my own envelopes and cards. I love to make envelopes. Love, love, love. I use these templates from Paper Source to make mine. These are my favorite templates because 1. they are sturdy 2. they have a groove where you slide a bone folder across and score the paper so it folds neatly and 3. they come in several different sizes. 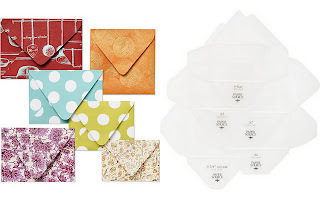 The envelopes you make with these templates will have a long front flap--I believe it is called a European style envelope. So you actually use a little more paper making these, but I don't mind because I love the usefulness of the templates and the look of the envelopes. These are also the style of envelopes you will find in the Paper Source store. I read about "bone folders" (or scoring tools) in the pages of Martha Stewart Living for years before I ever had one of my own or really understood what they were. Every paper craft in her magazine suggested the use of a bone folder, and since this was pre-online shopping and since I only had a Wal-Mart at my disposal, I was pretty limited in my craft supplies. But now I am happy to say I use a bone folder to score (dragging the tool across paper to make a slight indention so the paper folds easily) and to smooth out folds (when you don't want to smudge the paper by using your fingernail). I have made envelopes without scoring before, but it definitely makes for a cleaner finished product if you score before folding. You can get bone folders at most craft stores. I have a Martha Stewart one I got at Michaels and a small plastic one I got in a Klutz card making book (I bought the book for my sister many years ago and liked it so much I got one for myself; I don't use it any more for the patterns or templates, but the scoring tool and cutting mat that came with it are my favorites). I linked to the book on Amazon so you could see what it looks like, but you might be able to find it at craft stores as well (I got ours at Michaels; not sure if they still carry this particular title). Paper Source carries scoring tools as well--one made from real bone and one made from teflon. Update: This one from Hobby Lobby has the lowest price tag of any I have found, and it works great! As for what to put inside the envelope, the possibilities are endless! 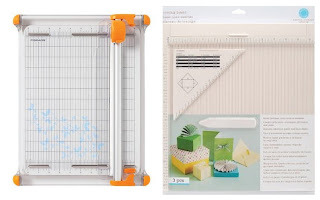 I like to cut and fold my own note cards, now that I have a paper trimmer I really like and a scoring board that makes the measuring and folding easy. You can find these several places, including Amazon, but I got mine at Michaels using two different 50% off coupons (making the scoring board $10 and the paper trimmer about $30). The paper trimmer is pretty straightforward--you cut paper with it. But this particular one is the best I have used so far because it cuts a straighter line than most. I also like that you can switch out the style of blade (deckle, scallop, perforated, etc.). I might have to dedicate a whole post to the scoring board itself, but for now I will just say that it has made measuring and folding card stock so much quicker and easier for me. It is basically a board with grooves on it, spaced out every 1/8 of an inch. You put your paper on the board, find the measurement you need, and then slide a bone folder straight down the paper, staying in the groove of the board. This creates an indented line (scores the paper), so you can now easily fold the paper at that line. I also use this scoring technique to "mark" my paper where I want to cut it, instead of drawing a line with a pencil. It is more precise and doesn't leave a mark. Well, I could go on and on about this topic. I like sharing this kind of thing because having good tools makes the job so much more enjoyable. I am kind of a walking commercial for the things I really like. But what I would like more than aaaaanything is to have you over for an envelope making craft night. I wish . . .
Having the right tools makes anything easier and more fun! So glad you like it! I love tools! As you already know. :) This is Mom C, isn't it? Thought so! Thanks for commenting. :) It's fun to hear from people this way. By the way, I will have to show you some things on the scoring board--maybe you should bring yours to Fam Vacation in June!